The BLINK Toolbox provides a blueprint for IVD test development. It is an assay design and development software platform that facilitates the development and validation of new assays on the actual product platform. 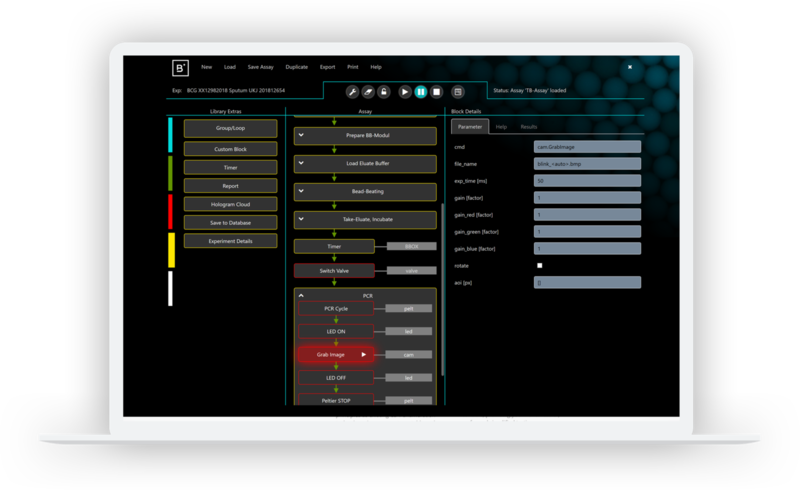 The software features a visual programming language with “drag and drop” functionality that allows the developer to build programs using code blocks that control all aspects of the assay workflow. An extensive library of pre-defined code blocks is provided with BLINK’s instrument hardware, disposables and reagents. These blocks can be used in their native state and integrated into more extensive workflows. Code blocks can also be customised by the addition of new parameters to suit the specific needs of the assay under development. The software records and stores all data generated during the development process in a relational database where it can be retrieved, sorted and compared. The existing code blocks come with documentation to accelerate the verification and validation processes required for assay development. By providing pre-defined code blocks, working examples and development documentation, and an experiment database, the Toolbox simplifies and accelerates creating, testing and documenting new applications.